This unit comes with a Cummins ISL 350, 350 HP engine, Allison 3000 RDS 6 speed automatic with auto-neutral transmission, MFS 16-143A 16,000 lb FL1 taper-leaf front suspension, and a RS26-185 T series 26,000 lb flat-leaf rear suspension. We have installed a APS9060 Bright finish Aluminum 1000 gal one compartment tank with a 48" x 124" shell with ASME flanged & dished heads. This unit has a rear sump with 4" flange, three (3)5" sight glasses, hose holder on rear head, aluminum hose trays on both sides, aluminum hose tube with door in drivers side walkway, aluminum tread plate hose protectors on both sides, and an aluminum ladder. It also has rear LED work lights, LED clearance lights, and wiring. This unit also comes with a Defender 500 vacuum pump by Challenger. It has 310 cfm @ 1200 rpm, with hydraulic motor drive and 400 series three-shaft gearbox. The tank incorporates one (1) flanged & dished baffle and internal stiffeners as required for pressure/vacuum. The tank is Hydro leak tested @ 19.5 psi. 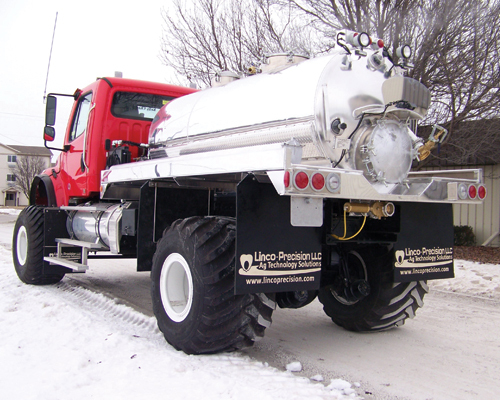 The tank has full-length aluminum 34" sills, 20" pressure manhole on top and rear, 3" primary shut-off, and 4" rear inlet flange with riser pipe and S/S deflector. The tank is a joint venture with Arthur Custom Tank, Arthur, IL. 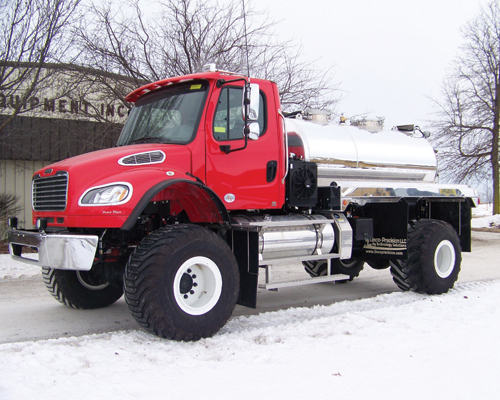 Arthur Custom Tank is a Subsidiary of Mid-State Tank Company. It can be set up with a Trimble, Ag Leader, or Raven Viper Pro rate controller with GPS and light bar. These units come with a 1yr/50,000 mi vehicle, and 2yr/200,000 mi Cummins warranty. 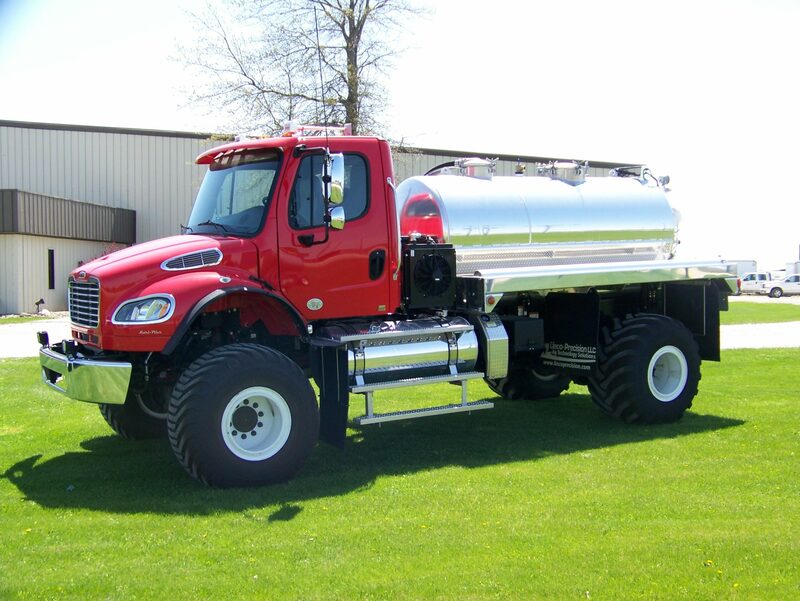 We can customize paint schemes tailored to the client's needs from our full service truck body shop. 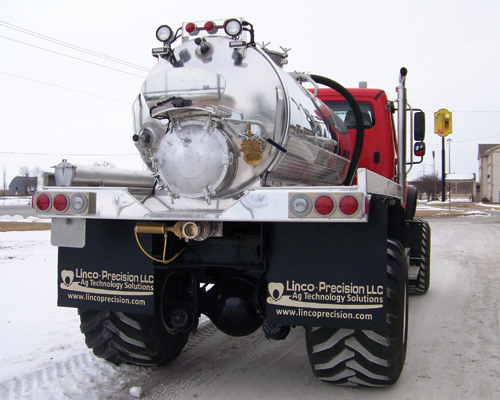 At Linco-Precision, we strive to make quality equipment available for all types of municipal and agricultural applications from GPS guidance, mapping, yield monitoring, liquid and dry fertilizer application, precision planter modifications, water management products and service.